Loved it, every bit of it. It is very small when folded, the software is easy to set up, it is fast (for the money). Having used professional 100-120 ppm scanners before this one feels quite comfortable in terms of speed for a SoHo use. Networking unit is quite handy - I mostly use that. Every computer can have it's own set of presets compiled, the network unit simply connects to a PC/Mac and reads it. You then can choose the one you need and scan to either computer, printer , server etc. This 30ppm sheet-fed duplex scanner offers powerful imaging features and simple integration into your document management systems with Document Capture Pro solutions. The DS-520 has a compact footprint and high-speed scanning of up to 30ppm / 60ipm, even at 300dpi in both colour and monochrome. This, combined with hardware JPEG compression, makes large scan jobs faster to process. With the optional Network Interface Unit, it is ideal for sharing across office and department networks. Epson Document Capture Pro and Document Capture Pro Server1 make it easy to integrate this business scanner into your document management system, speeding up workflow and enabling you to capture, convert and distribute scanned information into your document repositories. In addition, barcode recognition and Zonal OCR helps automate large document processes, such as file naming and folder creation. It's easy to integrate thanks to TWAIN, ISIS and WIA driver support. 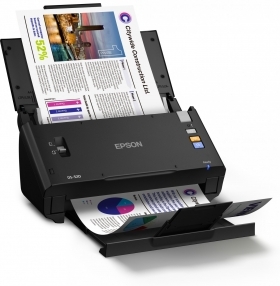 Epson's scanning software offers a wide range of advanced document imaging features, including multi-document size detection, text enhancement and automatic de-skew to improve efficiency and increase productivity. Add the optional Network Interface Unit to easily integrate into your company environment. Combined with Document Capture Pro/Pro Server1, the networked model increases employees productivity with customisable PushScan functions from the scanner panel such as scan-to Microsoft SharePoint and cloud services.